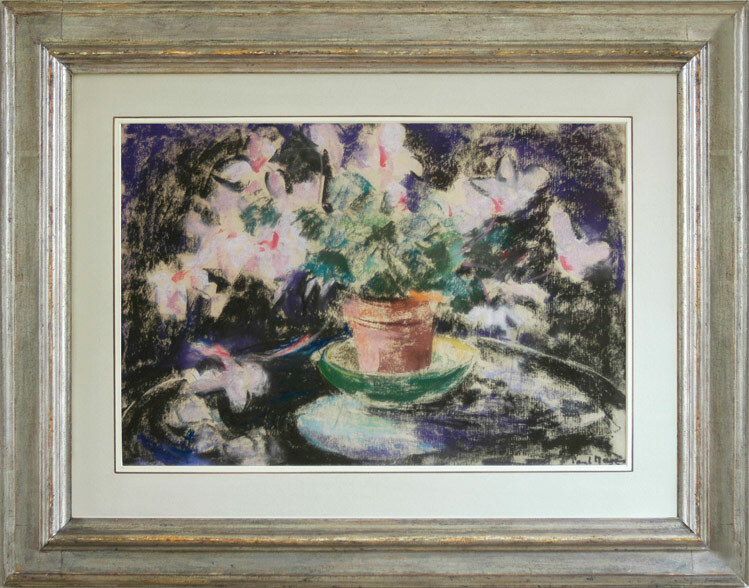 Another of Maze’s luminous flower pastels against a dark ground, this work in particular demonstrates his fluency in the medium. The flowers and leaves are sketched in with rapid panache, their shape only emerging as the spectator moves away, allowing the characteristic flying silhouette of the pink blooms and the dark heart-shaped leaves to emerge from the blocky marks of the pastel. The perspective is immaculate, and – from the reflected bowl and its softened colour – we catch the sense of an interior, apparently dark yet brightly illuminating the pot of flowers on its shining table. This still life was probably also painted in Maze’s Sussex cottage.